a few weeks than in a lifetime or in art and design school. When I lived in London and went looking for antiques, these sort of objets d’art would have cost a fortune; while the pieces in London were generally Neoclassical in date, Carlo Marchiori has captured the essences of many antique styles in his unique work. Yet he does not take himself too seriously – whimsy fills nearly every aspect of his art. Mondavi Winery. One often feels like walking into the famous 1963 movie set of Lampedusa’s The Leopard posthumous novel transplanted thousands of miles away, with ornate touches of stylistic reference to bygone splendors, even if not in the same materials. Where the European originals that continue to inspire Marchiori would use ormolu, bronze and marble, Marchiori masterfully integrates illusionary gilding, bronze patina paint and stucco or faux marbre in concrete to imitate these esteemed predecessors. Marchiori has also built and decorated his own period villa in Calistoga, appropriately named Villa Ca’Toga, as a Venetian reference. His sharp eyes and wit have assimilated so many styles over millennia it is difficult to point out known inspirations, but his villa and historical imagination seem to make allusions to Andrea Palladio (1508-80) as well as to the famous Villa Palagonia of Bagheria built in 1715-49 by architects Tommaso Napoli and Agatino Daidone for the Prince of Palagonia, Francesco Ferdinando II Gravina, a villa known for its amusing grotesques and often styled Villa dei Mostri (“Villa of Monsters”). Visits to his villa and shop (Ca’Toga Gallery or Galleria dell’Arte Ca’Toga) in Calistoga are highly recommended to better understand his imagination, but it could be on one’s wallet because it is impossible to walk away without investing in some piece, as I did last summer when I bought with my husband the large (19 inch) maiolica plate –one of the images in this article – in blue and white regaling us with its iconic winged lion of Venice and St. Mark. 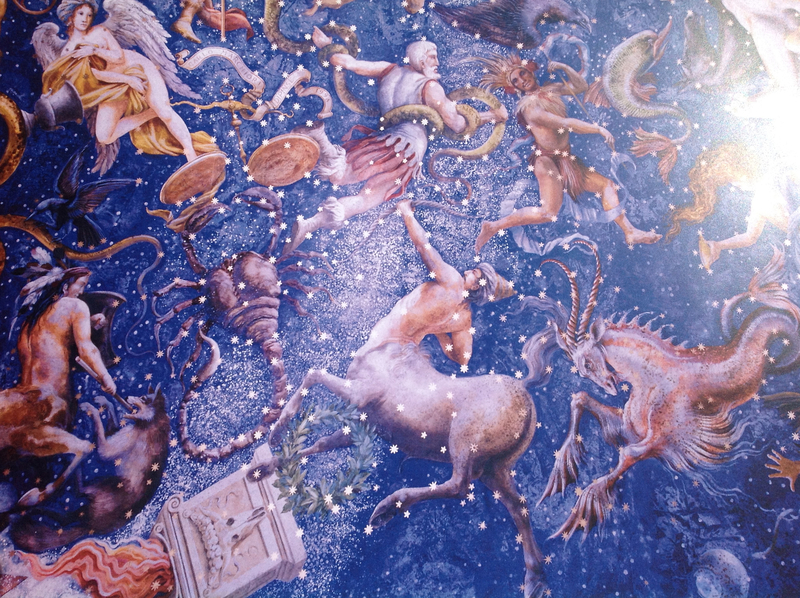 The ceiling in his shop, on Cedar Street just off Highway 29, is painted as an astronomical cosmography, a stunning array of colored animated zodiacal and other constellations, Milky Way and starbursts on blue, much like Andreas Cellarius’ Harmonia Macrocosmographia of 1660, yet without anything at all slavish since Marchiori’s own designs for myths and astronomical history are brilliant on their own, lively and full of movement across the dark blue night sky ceiling. Equally amazing are his interpretations of Classical and Neoclassical furniture, imbibing the Raphaelesque touches of frescoed Vatican loggias in Rome and the Robert Adam feel of Kenwood House above Hampstead Heath in London. 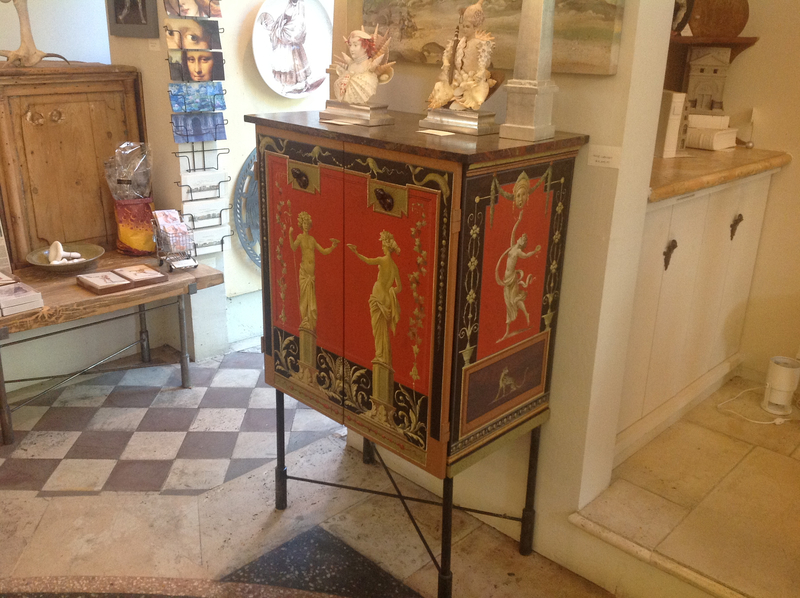 One Pompeian red cupboard cabinet framed in black, has satyrs and Pan figures playing the autos double flute, dancing maenads and trompe-l’oeil Classical female figures on pedestals interspersed with theatrical masks, dolphins and gold foliage (as seen in the lead image for this article). It is perfectly attuned to the Villa Boscotrecase style of Campania. 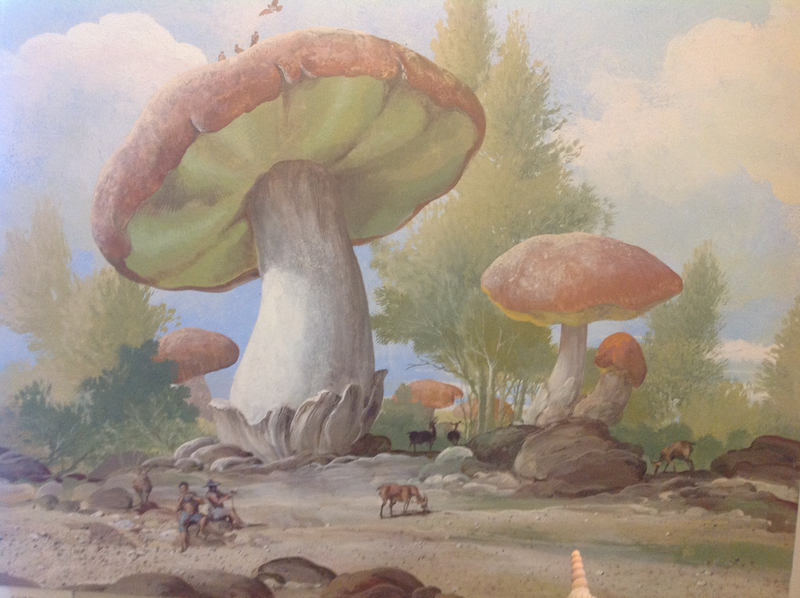 His extravagant landscapes with giant porcini mushrooms also remind one of Roman wall paintings, especially the Lastrygonians in Homeric lore but in this case also evoking Tiepolo’s fulsome Venetian clouds in his skies; his use of relief recalls the stucco friezes of the Nymphaeum of the Villa Giulia in Rome. 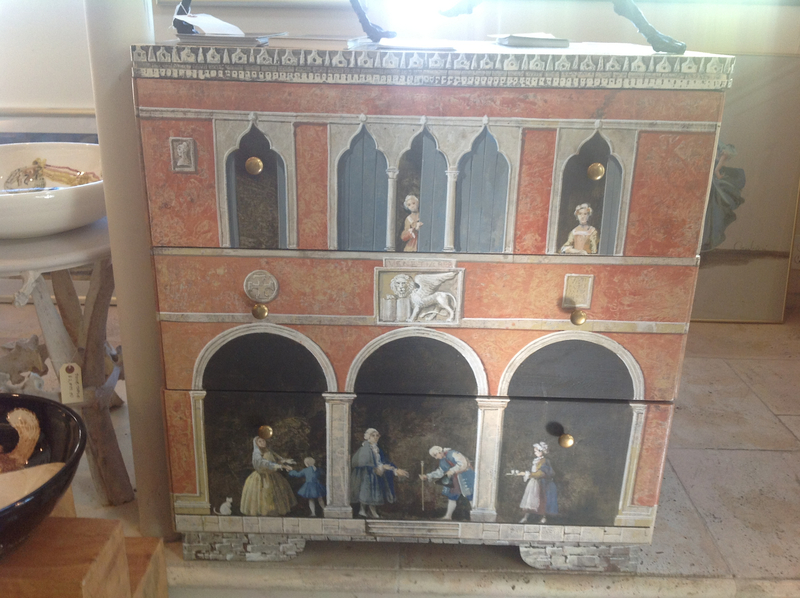 Another chest of drawers is a mock-up Venetian palazzo along the Rialto – looking much like a painting by Pietro Longhi – with one lower drawer being a loggia below the piano nobile upper drawer, a loggia where one expects to see a peruque-wearing masked Casanova strolling while waiting for his lover secreted behind a shutter. While some might quibble these conflations don’t work together, in Marchiori’s use of historic idiom, it all makes sense, unlike other artists in Las Vegas where the broad range of architectural and artistic quotations are dumbed down – not so with his genius, where every detail is not only important but also exact in replicating something historically recalled with finesse. Some of his other mural commissions include in the St. Francis Hotel in San Francisco and the Raffles Hotel in Singapore. His mural prices now easily ask and obtain hundreds of dollars per square foot. 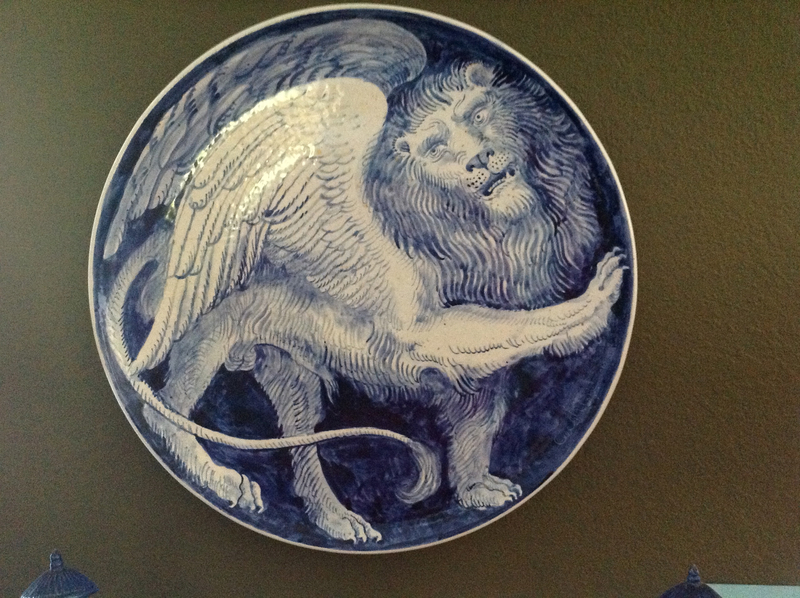 His ceramic series are also entertaining, somewhat akin to medieval manuscript grotesques and bas-en-page follies. Pulcinello and Arlequino from the Commedia dell’Arte are among his favorite stock characters. In fact, Pulcinello in all his rendered aspects may reflect something of the alter ego entertainer in Marchiori himself, cast larger than life but always with a twinkle in his eye. Visiting his Villa Ca’Toga – on the five acre empty plot he purchased and began building in 1987 – will be an enchanting experience. For anyone unable to journey to the top of Napa Valley, just across the Golden Gate Bridge in Marin County is Emporio Pasticceria Rulli, a signature café, enoteca/wine bar and pasticceria where Marchiori has painted on one wall a lavish pastel mural of a pastry gondola filled with eight pastry chefs and a pastry maiden in white toques all looking like Pulcinello, sailing from Venice perhaps to the Land of Cockaigne and it may be Marchiori himself asleep in the stern of the gondola. As an incredible illusionist and prolific artist, Carlo Marchiori reminds one of the films of Terry Gilliam (whose work he admires): cinematically brilliant, full of surprise, intensely colored, ample in spoof and lampoon, respected with a cult following; yet in contrast, Marchiori’s business is profitable from the outset. Since his work in any medium is not cheap to obtain, it always conveys that priceless aura of good taste because it registers and affirms the decorations that made history, like Diderot’s and D’Alembert’s Encyclopédie, the illustrated Dictionnaire raisonné des sciences, des arts et des métiers of the Enlightenment, although in Marchiori’s case an Italian version thereof. Perhaps Marchiori even prefers the Neoclassical epoch to the 21st century but anyone who takes the time to look carefully at his work will be astonished at his genius. He is the absolute master of theatrical trompe-l’oeil for our epoch and will be long acclaimed for his visual gifts that happen so rarely in any one generation. Carlo Marchiori. 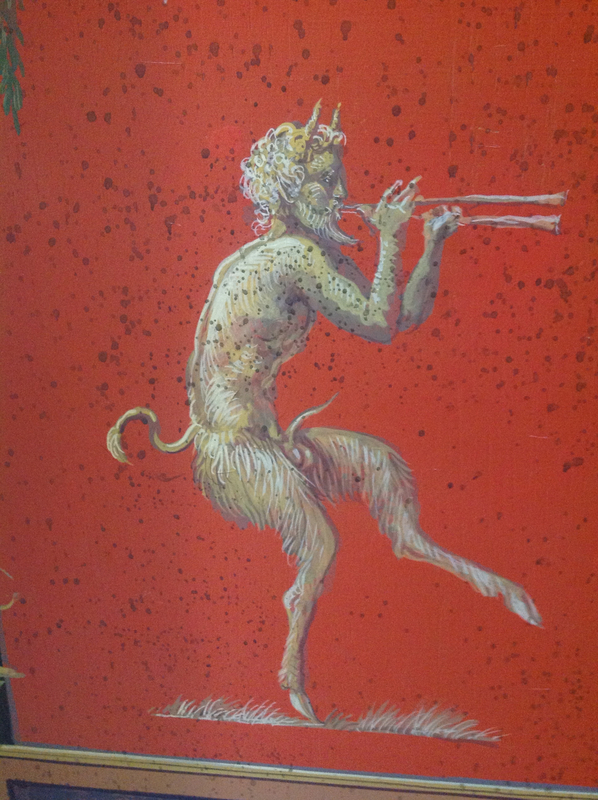 Festa Veneziana a Ca’Toga: The Imaginative World of a Venetian Artist in Napa Valley. Berkeley: Ten Speed Press (Random House), 2002.